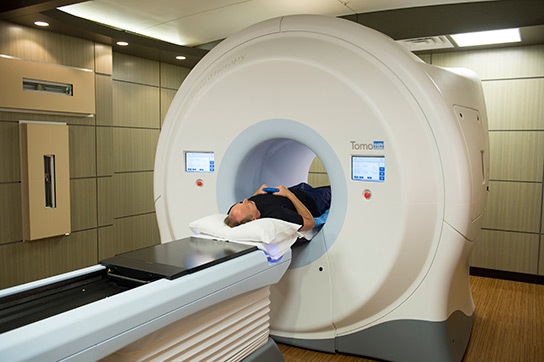 With its TomoTherapy HD System, the Palo Verde Cancer Center Scottsdale provides fast, effective radiation prostate cancer treatments that can potentially minimize side effects, such as diarrhea and urinary discomfort, which are common with conventional radiation therapy. The TomoTherapy HD System imaging capabilities allows Palo Verde Cancer Center Scottsdale doctors to confirm the location and size of your prostate before each treatment session, giving you the assurance that radiation will be delivered with extreme accuracy. This precision can potentially result in fewer side effects and typically allows patients to continue their normal daily routine throughout the course of treatment. Instead of a single beam of radiation, the TomoTherapy System divides radiation into smaller beamlets, enabling a treatment plan that is optimized for delivering maximum dose to the treatment field. Our doctors can contour radiation to the shape of your tumor, then the TomoTherapy HD System delivers the radiation beams continuously from all angles around your body. As a result of the real-time imaging immediately before treatment session, your doctor also can adjust the treatment plan for changes in rectal and bladder movements.